If you are a tax exempt entity, please contact Molly at molly@carezips.com to place your order so that you are not charged sales tax. After watching Caregivers struggle to change the adult briefs and seeing the discomfort the process caused to my parent, I thought surely there is a more efficient and more compassionate solution to address adult incontinence. 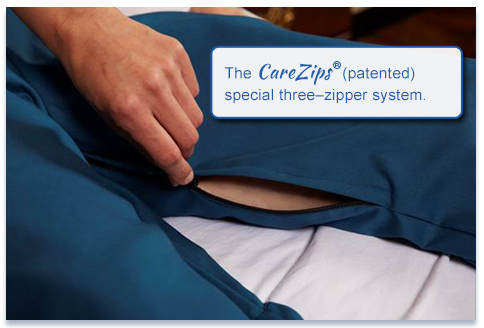 From this need, the patented product CareZips® was formed. 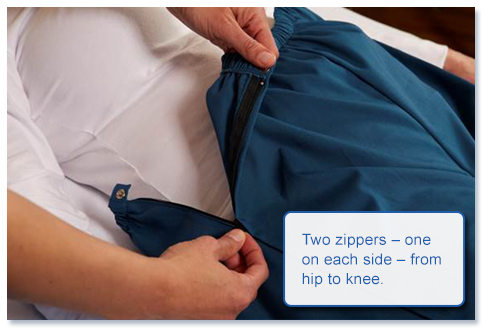 A pant unlike any other providing frontal opening from entire waist to both knees, enabling a faster change of the brief for the Caregiver while providing the adult more dignity, more comfort and confidence.